Opel plans extra shifts in Poland to build the new Astra, pictured. Opel/Vauxhall said on Wednesday that it will hire up to 250 engineers at its global technical development center in Germany. The General Motors Co. subsidiary needs more engineers at its Ruesselsheim center, near Frankfurt, to help achieve its goal of revamping 80 percent of its product lineup by 2014. The carmaker's 11 billion euro ($14.8 billion) product offensive includes eight major launches this year including the Meriva, Corsa, Movano and Astra Sports Tourer and another four in 2011, including the Ampera, Europe's first extended range electric car. Opel also plans to invest more in fuel-efficient powertrain technology including introducing pure battery-electric vehicles in smaller-size segments, start/stop technology, downsized engines and expanding LPG and CNG applications. The company also has accelerated efforts to introduce a minicar below its Corsa subcompact. 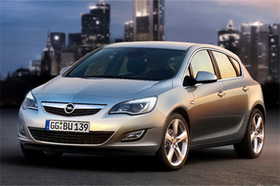 Opel said on Wednesday that it also plans five extra shifts during May and June and 17 at its Ruesselheim factory, where it builds the Insignia, and extra shifts in Gliwice, Poland for production of the new Astra hatchback. Russelsheim has so far built about 200,000 units of the Insignia, which was named Car of the Year 2009. Opel said it has received 120,000 orders for the latest generation Astra five-door hatchback, which was first launched in December 2009 in Germany and then throughout Europe. Opel´s work council head Klaus Franz sees even more engineers being hired in the midterm as new vehcile development projects are relocated from GM centers around the world to Europe. When he unveiled Opel's five-year plan in February, CEO Nick Reilly said future Opel cars will be developed in Ruesselsheim instead of development being shared among GM's global centers. Russelheim will develop the next generations of the Zafira minivan and Corsa.